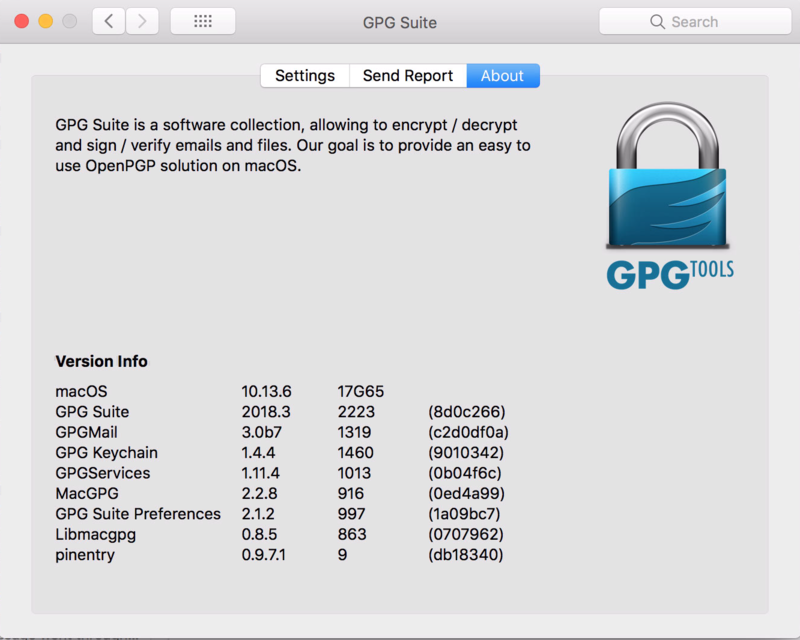 The GPG Suite Apple Mail plugin. When printing from Apple Mail, only the encrypted content is included in the printout. This also affects exporting to PDF from Apple Mail (both through File > Print > PDF > Save as PDF and File > Export as PDF). In previous versions of the Apple Mail plugin, when printing or saving to PDF, all encrypted and non-encrypted content was included. We upgraded the macOS version to 10.13.6. Upon opening Apple Mail, we found the version of the GPG Suite that was installed was not compatible, so we checked for updates and installed 2018.3. Viewing email worked as expected! When printing the email or saving to PDF, however, all non-encrypted content of the email is stripped out. I tried reinstalling GPG Suite 2018.3 again and rebooting, but observed the same behavior. Everything else works great, though. Thanks for this! This is a known issue in 2018.3. The mitigations for the EFAIL attack lead to a rewrite in some parts of GPGMail. We have a ticket for this problem. I connected this discussion with the existing ticket. That means, should this discussion get closed, it will be re-opened as soon as the ticket is closed. That way you'll stay in the loop and get notified as soon as we have news. Feel free to open a new discussions should you run into further problems or need assistance. Thanks, Steve! I really appreciate the technical background on the issue, too. Steve closed this discussion on 09 Aug, 2018 09:43 AM. Any word on the fix for this issue? I had the primary GPGMail user purchase a support plan last October, if it helps. thanks for pinging about this problem. We've not yet found the time to address this issue. So for now working around this printing bug is the only option. The easiest solution is to simply copy the decrypted text to TextEdit. We understand that this is quite annoying if you regularly print out your emails. Sadly there is no quick solution for this. Thanks! I will pass along the workaround.